James graduated from the University of Liverpool in 2015. 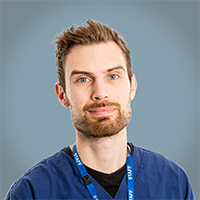 Following graduation, he completed an internship at an exotic referral and first opinion small animal practice in Hampshire. He then moved to Bournemouth in 2016 and spent two years at a busy first opinion practice with a high surgical and medical case load. James is primarily interested in internal medicine and hopes to specialise in this discipline upon completion of his internship.